The Bethany Harty Blog: He Ate WHAT? So in the midst of moving stuff today, Joe comes up to me and tells me that he swallowed a little metal thing. Great, I thought. Oh well. It will pass. I thought that it was a small ring from a key chain. Not ideal, but not too bad. 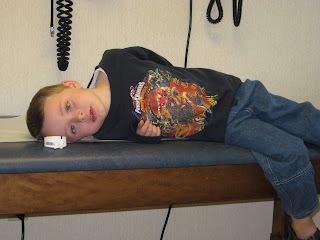 So, Brent and the 4 other kids head off for the park, and Joe and I head for the ER. Luckily there is one in our little town. It's only about 2 minutes away (closer than Wal-Mart, Mom). We get there, and get signed in, and they call us back. The Dr. comes in, and says that swallowing a coin isn't too bad, because it will come out no problem. But batteries are tricky. First he wants to do an x-ray to be sure that he did in fact swallow the battery. 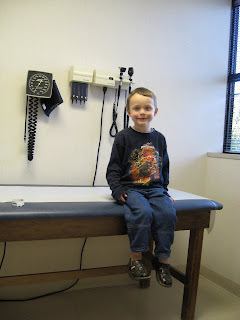 The Dr. goes out, and comes back in a few minutes. He said that he looked it up, and that as long as the battery passes in 48 hours, it's ok to have in your system. He was afraid that he was going to have to pump Joe's tummy or something. So that major crisis was evaded. So we take him to the x-ray room to see if he did eat the battery. He did. The x-ray showed that he had the button battery in his stomach. This was good news, the Dr. told us. The battery was not stuck in his throat or passages. It made it to the stomach. So now, we just wait for it to "pass". 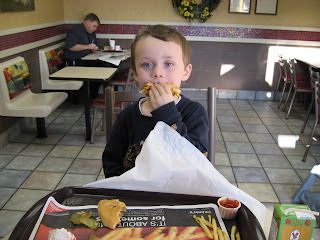 The Dr. ordered lots of greasy food, like Taco Bell or McDonalds or Pizza. Dr's orders! We are supposed to come back in tomorrow and have another x-ray to see if it's moving on, or if it's passed. Plus, we're on poop monitor to find the button battery. Any takers on that hunt? 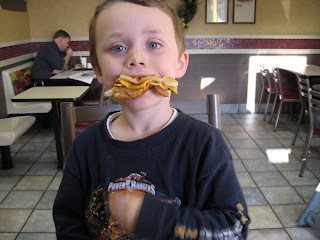 After we left the ER, we went to McDonalds for dinner. Greasy double cheeseburger with fries. Yummy! Then we headed on over to the park to play. What a day! Haha, that last picture is classic. Man, he HAS to eat lots of "good" food. That would make me want to swallow batteries more often. I never swallowed a battery, but I did swallow a marble once. That was fun. Oh my gosh! Is it because it is a button battery that they are not as concerned as a regular battery? My cousin swallowed a battery and they went in immediately with a make shift device to get it out because they were afraid the stomach acid would start to eat at the battery...... good luck with that....I don't envy being you being the "poop checker" Hope he is battery free soon!!! Well, we went back to the ER last night for the 24 hour check, and the new Dr for the night decided that we didn't need to x-ray, that if we didn't see it in 24 more hours, to take him to Children's hospital in Columbus (1 1/2 hours away). I asked if we could get an xray before I drove up there, and he said, no, that he would just send us up there if there was something wrong. The point that he didn't get was that I didn't want to drive 1 1/2 hours up there to see if the battery was still in his tummy or not. Wouldn't it be easier if I had him check out 2 1/2 minutes from my house? He didn't seem to get that. Maybe Brent can take him to our local ER and see if he can get any different results.